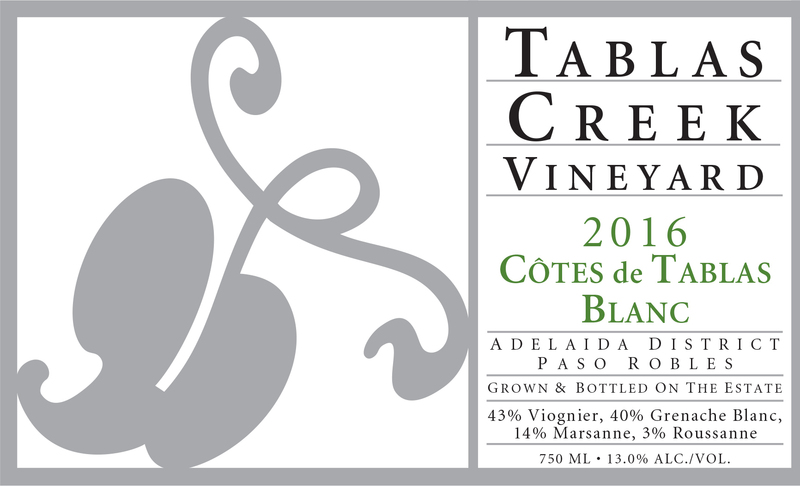 The Tablas Creek Vineyard 2016 Côtes de Tablas Blanc is a blend of four estate-grown white Rhône varietals. The wine, like most wines of the Southern Rhône, is a blend of varietals, featuring the floral aromatics and stone fruit of Viognier, the crisp acids and rich mouthfeel of Grenache Blanc, and the structure and minerality of Marsanne and Roussanne. The 2016 Côtes de Tablas Blanc has nn intense nose of peach pit, wet rocks, white tea and tarragon. The mouth is really nicely balanced, as its initial brightness and flavors of nectarine, preserved lemon, and mineral turn richer on the mid-palate, with sweet spices coming out. The finish brightens up again with notes of pink grapefruit and lemon verbena. Drink now and for at least the next five years. All varietals for the Côtes de Tablas Blanc were whole cluster pressed, and fermented in stainless steel to emphasize their clean crisp flavors and preserve their aromatics. Only native yeasts were used. After fermentation, the wines were racked and blended, and bottled in June 2017. The wine underwent only a light cold stabilization before bottling.